Mr. Gingrich introduces his study of the book of Ezra by giving us a general introduction to the book. He then exegetes the book itself by means of a unique outline-narrative. 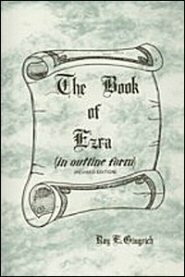 This outline-narrative method of unfolding the book’s content is effective because the book of Ezra is itself a narrative and because this method grips and holds the attention of the reader. Mr. Gingrich keeps a tight rein upon the subject matter and shows a fine balance between economy of space and time without sacrificing depth or spiritual applications. Each narrative section is followed by a concise listing of “The noteworthy and the narrative.” This pattern of narration is repeated throughout the book and is effective in teaching the reader that which should be learned from each section of the book. Although this book is written primarily for the layman and the undergraduate, the scholar will be blessed by reading its pages. Anything that Mr. Gingrich writes is worthy of being read by all students of the Bible. As a pastor, as a much-sought-after Bible expositor, as a college professor, and as a world traveler, he brings to his books profound study and rich experience.